Joshua Ryan "Josh" Hutcherson (born October 12, 1992) is an American actor. A native of Kentucky, Hutcherson began his acting career in the early 2000s and appeared in several commercials and minor film and television roles before landing his first major role in 2002 in the pilot episode of House Blend. His first film role was in Miracle Dogs (2003) on Animal Planet, followed by a motion-capture performance in The Polar Express (2004) and a voice-acting role in Howl's Moving Castle (2005). 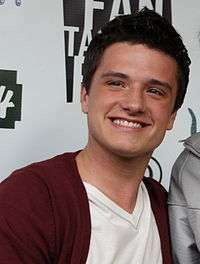 Hutcherson's other early film appearances include Little Manhattan, Zathura (both 2005), RV (2006), Bridge to Terabithia (2007), Journey to the Center of the Earth (2008), and The Kids Are All Right (2010). In 2011, he landed the leading role of Peeta Mellark in the box office record-setting film series The Hunger Games, released annually from 2012 to 2015, for which he won three MTV Movie Awards and a People's Choice Award. During the same period he also played a lead role in Journey 2: The Mysterious Island (2012) and a voice role in the animated film Epic (2013). Throughout his career, Hutcherson has expressed an interest in directing and producing. He has served as an executive producer in Detention (2011), The Forger (2012) and Escobar: Paradise Lost (2015), while also playing a lead role in each film. He is also heavily involved in the gay–straight alliance chapter called "Straight But Not Narrow". Born in Union, Kentucky, on October 12, 1992, Hutcherson is the elder son of Michelle (née Fightmaster), a former Delta Air Lines employee who now assists with Josh's career, and Chris Hutcherson, an analyst for the United States Environmental Protection Agency (EPA). His parents, who were also born and raised in Kentucky, met in high school in Dry Ridge. He has one younger brother, Connor. Hutcherson's interest in acting developed as a child despite his parents' concerns about the profession. According to the actor himself, he had "loved the entertainment industry" from the age of four. His father said that his son was compelled to perform for people from a very young age, possessing a personality that attracted people's attention. His mother said that he "bugged us so much" into becoming an actor, but believed it was a phase he was going through and would grow out of. Aged eight, Hutcherson went through the yellow pages and contacted an acting agency. In January 2002, he and his mother met acting coach Bob Luke, who travelled from New York City to Kentucky to meet them. Luke advised them to go to Los Angeles and begin auditioning Hutcherson for TV pilots. At the time, his only acting experience had been in a Kroger television commercial and a Vacation Bible School training film. For three years, Hutcherson and his mother lived in Los Angeles' Oakwood apartments, a housing community that accommodates young child actors and their families. Most of Hutcherson's childhood was spent on film sets rather than in a classroom. He attended New Haven Elementary School in Union until he began his career at the age of nine, after which he began homeschooling, with his mother as his teacher. He later returned to Kentucky to attend Ryle High School for one semester. Hutcherson played on the high school's soccer team and has been a keen sports enthusiast since, also displaying a passion for football and tennis. At the age of 13, he participated in a triathlon. He later said of his schooling experiences, "I know it's something kids have to deal with every single day but getting up at the same time every day and having to listen to teachers talk about things I could learn so much more easily on my own, I hated it." After moving to Hollywood in 2002, Hutcherson appeared in various television commercials. He landed his first major acting role as Nicky Harper in the 2002 pilot episode of House Blend, followed by minor roles in an episode of ER and the pilot episode of Becoming Glen. The following year, he played leading role Charlie Logan in the television film Miracle Dogs, which was released on Animal Planet. The film, Hutcherson's first, received a 79 percent approval rating on review aggregator Rotten Tomatoes. Later that year, he starred opposite Peter Falk and Tim Daly in the television film, Wilder Days, playing Falk's grandson who accompanies him on a turbulent road trip. Daly was impressed with the young Hutcherson, remarking, "He's an exceptional kid. He's a really good actor, and he's very smart and confident in himself." Hutcherson's next role was as a boy dressed as Robin in his first feature film appearance, the well-reviewed independent film American Splendor, which won the grand jury prize at the Sundance Film Festival. His character in 2004's fantasy film The Polar Express, young Hero Boy, was created by motion-capture of his facial expressions and body movements. The film starred Tom Hanks in the lead role and received mixed reviews from critics. In the animated fantasy film Howl's Moving Castle, he voiced the character of Markl, working alongside two other lead characters Christian Bale and Billy Crystal. All of his dialogue for the film was recorded in about eight consecutive hours. In 2005, Hutcherson appeared in several Hollywood films while trying to establish himself in the industry. He portrayed the minor role of Bucky Weston in the comedy Kicking & Screaming. In 2005's Little Manhattan, he had a lead role alongside his younger brother, Connor. Stella Papamichael of the BBC approved of his performance, saying that "Hutcherson's delivery is spot-on, showing a keen instinct for self-effacing humor that would make even Woody Allen feel that bit more inadequate", but Variety columnist Brian Lowry felt that Hutcherson "might have looked cute on the page, but even with his Linus voice the language and tone [didn't] feel natural." He next appeared in a lead role in Jon Favreau's Zathura, which he enjoyed filming owing to the number of special effects and stunts he was involved with. Hutcherson received the Young Artist Award for "Best Performance in a Feature Film by a Leading Young Actor" for the film. Hutcherson's next appearance was in the comedy RV in early 2006, playing the son of Robin Williams's character Bob Munro. He professed finding it difficult to concentrate during the production because he was "constantly laughing" at co-star Williams. The film was not received favorably by critics and audiences; Variety said the film suffered from "blunt predictability and meager laughs". He received his second Young Artist Award nomination for his role, but lost to Logan Lerman in Hoot. Hutcherson's breakthrough role in his career as a child actor came in 2007 when he portrayed Jesse Aarons in the fantasy drama Bridge to Terabithia. The film was shot on location in New Zealand for three and a half months. Hutcherson said of the filming: "That was an amazing experience. It doesn't get any prettier than that. There were beaches everywhere and all sorts of forests. We took little road trips everywhere and just had a lot of fun." He admitted to not having read the novel that the film is based upon before being cast. Author Ann C. Paietta describes his character of Jesse Aarons as "an introverted boy with four sisters, a financially strapped family, and a real talent for drawing" whose life is turned around when Leslie Burke (AnnaSophia Robb) arrives, with whom he creates an imaginary utopian world. Anne Hornaday of The Washington Post found his casting to be "a perfect fit" and commended how he portrayed the "sensitive, artistic, temperament" of his character, while Miriam Di Nunzio of the Chicago Sun-Times noted the chemistry between Hutcherson and Robb, referring to them as a "dynamic duo". He won his second Young Artist Award for "Best Performance in a Feature Film by a Leading Young Actor" for the film. Hutcherson's next role was in Firehouse Dog (2007), in which he played Shane Fahey, a firefighter's son who befriends a dog. He has expressed his pleasure in working and bonding with the four different dogs who played his canine co-star. The film received mixed reviews, although critics were favorable to Hutcherson. Following the film, Carrie Rickey of The Philadelphia Inquirer referred to him as the "Jodie Foster of Generation Y", remarking that with "each successive film Hutcherson dives deeper into his reservoir of shame and hurt and hope, unnerving for one so young, but also unusually urgent for an actor of any age." In 2008, he appeared in the independent crime drama Winged Creatures (released as Fragments on DVD) alongside Dakota Fanning as they portrayed two teenage friends who survive a massacre, and in Journey to the Center of the Earth, a 3D film adaptation of the novel of the same name where he portrayed a teen who travels to Iceland with an uncle he hardly knows, played by Brendan Fraser. Over the next two years, he appeared as a boy named Steve "Leopard" Leonard who visits a freak show with his friends in the vampire fiction film adaptation of the book Cirque du Freak and had a supporting role in the critically acclaimed The Kids Are All Right, portraying the son of a lesbian couple, played by Annette Bening and Julianne Moore. According to Kaleem Aftab of The Independent, his role in the film was a pivotal point in his career and one of vital importance to continuing his career into adulthood. Hutcherson expressed gratitude at being cast in the film, displaying satisfaction with the intimacy and creative freedom that independent films provide over studio films. The film won the Golden Globe Award for Best Motion Picture – Musical or Comedy in 2010, and was a nominee for Best Picture at the 83rd Academy Awards. Gregory Ellwood of entertainment site HitFix stated: "Hutcherson's charismatic wit and natural instincts shine and it's arguably the first film where he proves he's more than just another sharp-looking teen actor." That role is so key to have a boy that can use language. That's how Peeta navigates the world, that's his gift, and Josh was the only one who could bring that to life in such a real and natural way. On April 4, 2011, Lionsgate announced that Hutcherson had been cast as Peeta Mellark in The Hunger Games series, opposite Jennifer Lawrence as Katniss Everdeen. He was eager to land the role, feeling that he related to the character extremely well. In preparation for filming, he had to bleach his hair and gain 15 pounds. Lawrence, a close friend, has always spoken highly of him as an actor; in regards to his portrayal of Peeta Mellark she stated, "He's charming, he's sweet, he's down to earth, he's normal. He embodies all of it and brings it all to Peeta ... he's got all those great qualities and every single one of them comes across in every line he says out loud as Peeta." He became known for his pranks on set, leading to an accident as he was play-fighting with Lawrence who kicked him in the head, unintentionally knocking him unconscious and giving him a concussion. The initial film, The Hunger Games, was released on March 23, 2012, and went on to become one of the highest-grossing films of the year. Hutcherson received the MTV Movie Award for "Best Male Performance". He was also awarded the 2012 NewNowNext award for "Next Mega Star" and the National Association of Theatre Owners's 2012 CinemaCon award for "Breakthrough Performer of the Year". Peter Travers of Rolling Stone described the actor's portrayal saying, "[Hutcherson] brings humor and a bruised heart to a boy who needs to mature fast." Between landing the role in The Hunger Games and the film's release, he played a lead role and served as an executive producer for two films: Detention (2011) and The Forger (2012). In Detention, he played the role of popular teenager Clapton Davis in a film the plot of which has been compared to 1985's The Breakfast Club. His role in The Forger was as a 15-year-old orphan who finds himself in trouble until Alfred Molina's character comes to his aid. The film was not well received but the actors' chemistry together and their performance was. He next reprised his role as Sean Anderson in the 2012 Journey to the Center of the Earth sequel, Journey 2: The Mysterious Island. Hutcherson has always been vocal about his desire to work on films of all sorts of genres. Regarding the switch from comedy-drama The Kids Are All Right to the Journey sequel, he stated: "For me, I like to do all different types of films and to go from having that awesome [indie] kind of thing that I love doing so much with great characters and a really great script to a bigger kind of studio film, to just cover the whole kind of spectrum of movies is really, really cool." Although the film was largely panned, it fared well commercially and his performance was well received, with Kofi Outlaw of Screenrant.com appreciating how he "does a good job holding the screen and portraying a somewhat layered protagonist". Later in 2012, he appeared in Red Dawn, a remake of the 1984 film of the same name. The film was panned by critics, achieving only a 12 percent approval rating on Rotten Tomatoes, the lowest score of any film Hutcherson has acted in. 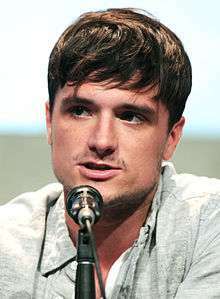 In 2013, Hutcherson voiced the character Nod in the animated action-adventure 3D film Epic, loosely based on William Joyce's book, The Leaf Men and the Brave Good Bugs; the film is his most commercially successful except for The Hunger Games series. As filming approached for The Hunger Games sequel, The Hunger Games: Catching Fire, he enlisted celebrity trainer Bobby Strom to assist him in five hour-long workouts per week. The film brought in $420 million at the North American box office, making it his most commercially successful film. Todd Gilchrist of Indiewire proclaimed of the actor's performance that "Hutcherson's maturing talents achieve a parallelism with the character's self-actualization, proving subtler and more self-aware with every resigned decision he makes on behalf of the people around him that he loves." Hutcherson received his second MTV Movie Award for "Best Male Performance" for his role in the sequel. On November 23, 2013, the day following The Hunger Games: Catching Fire's United States release, Hutcherson hosted an episode of Saturday Night Live. His performance received mediocre reviews, with Mike Ryan of The Huffington Post stating that he did not really bring "anything special to the table except having a nice attitude", and John Surico of GQ remarking that "while the night didn't necessarily disappoint, it also didn't dazzle". Hutcherson again reprised his role in the two feature-length parts of the Mockingjay film adaptation. The Hunger Games: Mockingjay – Part 1 was released on November 21, 2014, and Part 2 followed on November 20, 2015. His character goes through a significant personality change in the films, which provided him with an acting challenge; he said, "I'm nervous about portraying it because I've never gone crazy before in a movie." Emily Yahr of The Washington Post spoke positively of his acting, by saying "Peeta's crazed expression is sure to haunt our nightmares for a long time," while David Edelstein of New York criticized his portrayal in relation to scenes with the other characters, saying "at least Josh Hutcherson's captured Peeta is mostly seen in interviews with Stanley Tucci's camp talk-show host on TV screens ... so the actor can't bring his lack of urgency to scenes with [Jennifer Lawrence]." Before filming the Mockingjay movies, Hutcherson filmed Escobar: Paradise Lost, a French-Spanish romantic thriller film, which was released on January 16, 2015, in the U.S. He also served as an executive producer for the film, alongside first-time director Andrea Di Stefano, assisting with casting and blocking shots. Hutcherson said the opportunity "made [him] so hungry to do more like that". Hutcherson has cited actor Jake Gyllenhaal as an inspiration, admiring the way Gyllenhaal "has taken his career and the kind of jobs that he's taken". He has also named actor, director, and producer Philip Seymour Hoffman as another of his inspirations. Hutcherson currently lives in Los Angeles, California. In May 2012, he purchased the 1,861-square-foot (172.9 m2) $2.5 million former house of Heath Ledger in Laurel Canyon in the Hollywood Hills, a small ranch built in 1951. He professes that his fame has not changed him as a person, stating, "I love my job more than anything in the world and I could never imagine doing anything else. So this whole thing is a very small price to pay compared to someone who has to go to an office to work." As a known ally to the LGBT (lesbian, gay, bisexual, and transgender) community, Hutcherson advocates the gay–straight alliance campaign "Straight But Not Narrow". Since its formation, he has been its most active supporter. His involvement with the LGBT community stems from his family ties; two of his uncles who were gay died of AIDS-related illnesses. In April 2012, he became the youngest recipient of the Vanguard Award from GLAAD, given for promoting equal rights for LGBT people. He was also awarded with Young Humanitarian Award at the 2015 unite4:humanity award ceremony. Regarding his own sexuality, he considers himself to be "mostly straight" and does not believe in being limited by labels. Hutcherson also worked alongside The Trevor Project and human-I-T in 2014 when he began his campaign "Power On", which serves to help young LGBT people from rural areas to form communities by donating old computers and cell phones to LGBT resource centers; he began the campaign by donating an old computer of his own. Annually from 2012 through 2014, he has hosted the "Josh Hutcherson Celebrity Basketball Game" in Los Angeles, which raises funds and awareness for the "Straight But Not Narrow" campaign. In November 2013, Hutcherson and Queen Latifah presented trophies together to four young community volunteers in a live ceremony at the fifth annual TeenNick HALO Awards at the Hollywood Palladium. Matthew Inwood Episode: "Till Death Do Us Part"
Donny Rawlings Episode: "Take the Money and Run"
Van-El / Young Bruce Wayne Voice role; Episode: "For the Man Who Has Everything"
Guest judge Episode: "Let The Games Begin"
During the first stage of Hutcherson's acting career, he received eight Young Artist Award nominations, four of which he won. He and the cast of 2010's The Kids Are All Right received eight nominations for "Best Cast" or "Best Ensemble" by eight different organizations including SAG-AFTRA and Broadcast Film Critics Association. For The Hunger Games, Hutcherson and his co-stars were nominated for ten awards, winning eight of them, including National Association of Theatre Owners' 2012 "Breakthrough Performer of the Year" and Logo TV's 2012 "Next Mega Star". 1 2 3 4 White, Danny (2013). Jennifer, Liam, and Josh: An Unauthorized Biography of the Star of The Hunger Games. Michael O' Mara Books Limited. ISBN 978-1-78243-184-8. 1 2 3 Kiesewetter, John (October 19, 2003). "11-year-old finds sudden stardom". The Cincinnati Enquirer. Retrieved April 11, 2011. ↑ Sherri Mabry Gordon (September 1, 2013). Josh! : Leading Man Josh Hutcherson. Enslow Publishers, Inc. p. 5. ISBN 978-0-7660-4200-1. ↑ "Fun Facts About Josh Hutcherson". The Ellen DeGeneres Show. February 8, 2012. Retrieved December 4, 2013. ↑ "Josh Hutcherson Biography". FYI. Retrieved December 4, 2013. 1 2 "Josh Hutcherson: Full Biography". The New York Times. Retrieved December 3, 2013. 1 2 3 "Josh Hutcherson Interview". KidzWorld. Retrieved December 1, 2014. 1 2 3 Aftab, Kaleem (November 14, 2014). "The Hunger Games' Josh Hutcherson interview: Coping with the pressure with being the star of a Hollywood franchise". The Independent. Retrieved December 16, 2014. ↑ "Josh Hutcherson's new 'journey' to stardom". Qatar Tribune. February 2, 2012. Retrieved December 29, 2014 – via HighBeam Research. (subscription required (help)). 1 2 Bird, Rick (April 28, 2006). "Josh: A rising star". The Cincinnati Post. p. C1. ↑ "Kentucky Child Star Sharing Stage with Hanks". Cincinnati Commercial Tribune. October 18, 2003. Retrieved December 29, 2014 – via HighBeam Research. (subscription required (help)). 1 2 3 Buchanan, Kyle (August 3, 2009). "The Verge: Josh Hutcherson". Movieline. Retrieved December 19, 2014. ↑ "Child Actor Program". Oakwood. Retrieved December 19, 2014. 1 2 3 4 Sperling, Nicole (March 20, 2012). "'Hunger Games': Josh Hutcherson on Peeta, fame, Jennifer Lawrence". Los Angeles Times. Retrieved December 6, 2014. 1 2 Herold, Kendall (August 7, 2012). "Local 'Hunger Games' star raising money for N.Ky. car crash victim". WCPO-TV. Archived from the original on December 11, 2014. Retrieved December 7, 2014. 1 2 3 Sells, Mark. "Josh Hutcherson Interviewed by Mark Sells November 2005". Oregon State Media, Inc. Archived from the original on August 27, 2008. Retrieved December 19, 2014. 1 2 Carpenter, Edwin L. (April 9, 2007). "Josh Hutcherson is Living His Dream as an Actor". The Dove Foundation. Retrieved September 16, 2011. ↑ "Miracle Dogs (2003)". The New York Times. Retrieved December 3, 2013. ↑ "Miracle Dogs (2003)". Rotten Tomatoes. Retrieved January 29, 2014. ↑ "Wilder Days (2003)". The New York Times. Retrieved October 20, 2014. ↑ "American Splendor (2003)". The New York Times. Retrieved December 3, 2013. ↑ Halperin 2004, p. 252. ↑ Kiesewetter, John (December 5, 2012). "Holiday TV: Josh Hutcherson Rides the Polar Express". Cincinnati Commercial Tribune. Archived from the original on October 21, 2014. Retrieved October 20, 2014. ↑ "The Polar Express (2004)". Rotten Tomatoes. Retrieved January 29, 2014. ↑ "Howl's Moving Castle (2004)". The New York Times. Retrieved December 3, 2013. ↑ "Kicking & Screaming: Cast and Crew". Fandango. Retrieved October 20, 2014. ↑ "Little Manhattan Synopsis". Fandango. Retrieved October 20, 2014. ↑ Papamichael, Stella (July 6, 2006). "Little Manhattan (2006)". BBC. Retrieved December 29, 2014. ↑ Lowry, Brian (September 29, 2005). "Review: 'Little Manhattan'". Variety. Retrieved December 7, 2014. ↑ "Zathura Synopsis". Fandango. Retrieved October 20, 2014. ↑ Bird, Rick (November 10, 2005). "Up and Coming Local Star: Josh Hutcherson". The Cincinnati Post. Retrieved December 29, 2014 – via HighBeam Research. (subscription required (help)). 1 2 "27th Annual Awards". Young Artist Association. March 25, 2006. Retrieved November 27, 2013. ↑ "N. Kentucky young star, Bee in films". The Cincinnati Post. April 21, 2006. p. T7. ↑ "RV (2006)". Fandango. Retrieved October 20, 2014. ↑ Bird, Rick (April 28, 2006). "Josh: A Rising Star". The Cincinnati Post. Retrieved December 29, 2014 – via HighBeam Research. (subscription required (help)). ↑ Chang, Justin (April 27, 2006). "Review: 'RV'". Variety. Retrieved December 7, 2014. 1 2 "28th Annual Awards". Young Artist Association. March 10, 2007. Retrieved November 28, 2013. ↑ "Bridge to Terabithia:Stars Loved New Zealand". The Cincinnati Post. February 20, 2007. Retrieved December 29, 2014 – via HighBeam Research. (subscription required (help)). 1 2 Westhoff, Jeffrey (February 15, 2007). "Westhoff: 'Terabithia' stars hope to inspire imaginations". Northwest Herald. Archived from the original on January 7, 2014. Retrieved January 6, 2014. ↑ Paietta 2007, p. 33. ↑ Hornaday, Anne (February 16, 2007). "'Bridge': Crossing Into The Heart of Childhood". The Washington Post. Retrieved December 29, 2014. ↑ Di Nunzio, Miriam (February 16, 2007). "Imagination triumphs in 'Bridge to Terabithia'". Chicago Sun-Times. Archived from the original on March 10, 2007. Retrieved December 29, 2014. 1 2 3 "29th Annual Awards". Young Artist Association. Retrieved November 27, 2013. 1 2 3 Jacobs, Evan (March 30, 2007). "INTERVIEW: Josh Hutcherson Talks Firehouse Dog". MovieWeb. Retrieved October 20, 2014. ↑ Chun, Alex (April 4, 2007). "From pampered pooch to intrepid 'Firehouse Dog'". Los Angeles Times. Retrieved December 7, 2014. ↑ Rickey, Carrie (April 4, 2007). "From dog star to star of a boy's life". The Philadelphia Inquirer. Archived from the original on March 4, 2014. Retrieved December 20, 2014. ↑ Fleming, Michael (March 28, 2007). "Hudson may star in 'Winged'". Variety. Retrieved April 1, 2007. ↑ Pickle, Betsy (July 26, 2008). "Teen star enjoys 'Journey' of role". The Journal Gazette. Scripps Howard News Service. Archived from the original on December 2, 2013. Retrieved December 20, 2014. ↑ "Cirque du Freak: The Vampire's Assistant (2009)". The New York Times. Retrieved December 3, 2013. ↑ "The Kids Are All Right (2010)". The New York Times. Retrieved December 3, 2013. 1 2 Ellwood, Gregory (July 7, 2010). "Josh Hutcherson talks Kids Are All Right, Red Dawn and dreams of a Spider-Man never to be". HitFix. Retrieved December 16, 2014. ↑ Rich, Katey (July 13, 2010). "Interview: The Kids Are All Right's Josh Hutcherson". Cinema Blend. Retrieved December 16, 2014. ↑ Sciretta, Peter (January 16, 2011). "2011 Golden Globe Award Winners". /Film. Retrieved November 29, 2014. ↑ "2010 Academy Awards® Winners and History". AMC. 2010. Retrieved November 29, 2014. ↑ Valby, Karen (April 7, 2011). "Team 'Hunger Games' talks: Author Suzanne Collins and director Gary Ross on their allegiance to each other, and their actors". Entertainment Weekly. Retrieved December 7, 2014. ↑ Sperling, Nicole (April 4, 2011). "'The Hunger Games': Josh Hutcherson and Liam Hemsworth complete the love triangle". Los Angeles Times. Retrieved April 4, 2011. ↑ "'The Hunger Games' Movie: Josh Hutcherson Cast As Peeta, Liam Hemsworth As Gale". The Huffington Post. April 4, 2011. Retrieved December 2, 2013. ↑ "Peeta Mellark". People. March 28, 2012. Retrieved December 1, 2014. ↑ Valby, Karen (May 20, 2011). "'The Hunger Games': Jennifer Lawrence defends her Peeta and Gale". Entertainment Weekly. Archived from the original on May 23, 2011. Retrieved December 8, 2014. ↑ Delahaye, Gabe (February 6, 2012). "Introducing The Youngest Hollywood Prankster In The Prank Game: Josh Hutcherson". Videogum. Retrieved December 2, 2014. ↑ "Josh Hutcherson On Getting Concussion From Jennifer Lawrence On 'Hunger Games' Set On 'Late Show With David Letterman'". The Huffington Post. March 22, 2012. Retrieved December 8, 2014. 1 2 3 4 5 "2012 Movie Award Winners". MTV. June 3, 2012. Retrieved December 3, 2013. 1 2 "2012 NewNowNext Award Winners". Logo. Retrieved December 20, 2014. 1 2 "Josh Hutcherson to Receive "CinemaCon® Breakthrough Performer of the Year Award"". National Association of Theatre Owners. March 27, 2012. Retrieved October 20, 2014. ↑ Travers, Peter (March 21, 2012). "The Hunger Games". Rolling Stone. Retrieved December 7, 2014. ↑ "Detention (2011)". The New York Times. Retrieved December 3, 2013. ↑ "Josh Hutcherson Filmography". Fandango. Retrieved December 3, 2013. ↑ Nayman, Adam. "After-School Special: Joseph Kahn's Detention". Retrieved December 30, 2014. ↑ Rugaard, Jason (July 16, 2012). "The Forger (2012) – Review". Retrieved December 30, 2014. ↑ "Journey 2: The Mysterious Island". Rotten Tomatoes. Retrieved December 2, 2013. ↑ "Journey 2: The Mysterious Island (2012)". Box Office Mojo. Retrieved December 2, 2013. ↑ Murray, Rebecca. "Josh Hutcherson and Vanessa Hudgens Discuss 'Journey 2: The Mysterious Island'". About.com. Retrieved December 29, 2014. ↑ Fine, Marshall (February 7, 2012). "Movie Review: Journey 2: The Mysterious Island". The Huffington Post. Retrieved December 26, 2014. ↑ Outlaw, Kofi (February 10, 2012). "'Journey 2: The Mysterious Island' Review". Screen Rant. Retrieved December 26, 2014. ↑ "Red Dawn (2012)". Rotten Tomatoes. Retrieved December 1, 2013. 1 2 3 "Josh Hutcherson". Rotten Tomatoes. Retrieved February 5, 2014. ↑ "Epic". The New York Times. Retrieved December 3, 2013. ↑ "Epic (2013)". Rotten Tomatoes. Retrieved December 3, 2013. ↑ Tranell, Kim. "Exclusive First Look: Josh Hutcherson's Catching Fire Workout". Men's Fitness. Retrieved December 2, 2014. ↑ Gilchrist, Todd (November 12, 2013). "Review: 'The Hunger Games: Catching Fire' Starring Jennifer Lawrence, Liam Hemsworth & Josh Hutcherson". Indiewire. Retrieved December 1, 2014. 1 2 "Winners". MTV. April 13, 2014. Retrieved November 13, 2014. ↑ "Lady Gaga to Host 'SNL'; Josh Hutcherson Also Tapped". The Huffington Post. October 31, 2013. Retrieved December 3, 2013. ↑ Watkins, Gwynne (November 24, 2013). "'SNL' Catches 'Hunger Games' Fever With Josh Hutcherson". Rolling Stone. Retrieved January 11, 2014. ↑ Ryan, Mike (November 24, 2013). "'SNL' Scorecard: Josh Hutcherson Is Offered Up As A Serviceable Tribute". The Huffington Post. Retrieved November 29, 2014. ↑ Surico, John (November 25, 2013). "The Saturday Night Live Recap: Josh Hutcherson and Haim". GQ. Retrieved November 29, 2014. ↑ Fritz, Ben (July 10, 2012). "'The Hunger Games: Mockingjay' release dates set for 2014, 2015". Los Angeles Times. Retrieved January 6, 2014. ↑ "Josh Hutcherson talks Peeta in The Hunger Games: Mockingjay: 'I'm nervous – I've never gone crazy in a movie before'". sugarscape.com. November 16, 2013. Retrieved November 29, 2014. ↑ Yahr, Emily (November 23, 2014). "'The Hunger Games: Mockingjay Part 1': What was the most disturbing scene?". The Washington Post. Retrieved November 29, 2014. ↑ Edelstein, David (November 17, 2014). "The Hunger Games: Mockingjay – Part 1 Is Bleak, Depressing, and Really Good". New York. Retrieved December 29, 2014. ↑ James White (November 14, 2014). "Escobar: Paradise Lost Trailer Unveiled". Empire. Retrieved November 14, 2014. 1 2 Krochmal, Shana Naomi (October 9, 2013). "Josh Hutcherson, Straight Talker". Out. Retrieved December 2, 2014. ↑ Steele, Michael (2014). "Hunger Games: Mockingjay". Us Weekly: 63. 1 2 David, Mark (May 21, 2012). "Josh Hutcherson Buys Tree House in Tinseltown". Variety. Retrieved December 19, 2014. ↑ Blacklow, Jeremy (October 9, 2013). "Josh Hutcherson Gets Candid About His Sexuality". Yahoo!. Retrieved February 9, 2014. ↑ "3rd Annual Josh Hutcherson Celebrity Basketball Game Returning to the Nike 3ON3 Basketball Tournament at L.A. LIVE". Anschutz Entertainment Group. June 23, 2014. Retrieved November 28, 2014. ↑ "The Team". Straight But Not Narrow. Archived from the original on February 24, 2015. Retrieved November 28, 2014. ↑ Malkin, Marc (April 19, 2012). "Hunger Games' Josh Hutcherson Opens Up on Gay Rights: I Had Two Uncles Die From AIDS". E!. Retrieved February 10, 2014. ↑ Donnelly, Matt (April 16, 2012). "'Hunger Games' star Josh Hutcherson to receive GLAAD honor". Los Angeles Times. Retrieved April 16, 2012. ↑ Oldenburg, Ann (February 20, 2015). "Josh Hutcherson tells us his Oscar best picture pick". USA Today. Retrieved February 20, 2015. ↑ Ehrhardt, Michelle (August 8, 2014). "Josh Hutcherson's New Campaign to Connect LGBTQ Youth". Out. Retrieved February 1, 2015. ↑ "Josh Hutcherson Celebrity Basketball Game — Event Overview". Nike. Archived from the original on December 5, 2014. Retrieved November 28, 2014. ↑ "Josh Hutcherson, Queen Latifah to honor teens". Hindustan Times. November 4, 2013. Retrieved December 29, 2014 – via HighBeam Research. (subscription required (help)). ↑ "25th Annual Awards". Young Artist Association. Retrieved November 27, 2013. 1 2 "26th Annual Awards". Young Artist Association. Retrieved November 28, 2013. ↑ "30th Annual Awards". Young Artist Association. Retrieved January 6, 2014. ↑ Knegt, Peter (October 18, 2010). ""Winter's Bone" Leads 2010 Gotham Award Nominations". Indiewire. Retrieved January 9, 2014. ↑ "2010 WAFCA Awards – The Washington DC Area Film Critics Association (WAFCA)". Washington D.C. Area Film Critics Association. December 6, 2010. Retrieved January 9, 2014. ↑ Morris, Wesley (December 13, 2010). "'Social Network' is tops with Boston Society of Film Critics". The Boston Globe. Retrieved January 9, 2014. ↑ Carlson, Alex (January 10, 2011). "Catching Up on Some Critics Awards". Film Misery. Retrieved January 9, 2014. ↑ "16th Annual Critics' Choice Movie Awards (2011)". Broadcast Film Critics Association. November 20, 2011. Retrieved January 9, 2014. ↑ "The 17th Annual Screen Actors Guild Awards". Screen Actors Guild. Retrieved January 9, 2014. 1 2 "Teen Choice Awards 2012: List of winners". CBS News. July 23, 2012. Retrieved January 9, 2014. ↑ Rome, Emily (August 20, 2012). "Ben Affleck, Lea Michele, Will.i.am, other celebs honored at Do Something Awards". Entertainment Weekly. Retrieved December 3, 2013. ↑ "'The Hunger Games' wins big at People's Choice Awards". Entertainment Weekly. January 10, 2013. Retrieved December 3, 2013. ↑ Nordyke, Kimberly (August 10, 2014). "Teen Choice Awards: The Complete Winners List". The Hollywood Reporter. Retrieved November 13, 2014. ↑ Longeretta, Emily (June 9, 2015). "Teen Choice Awards Pit One Direction Against Zayn Malik". Hollywood Life. Retrieved June 14, 2015. Halperin, James L. (May 1, 2004). Heritage Signature Auction #811. Ivy Press, Heritage Capital Corporation. ISBN 978-1-932899-12-2. Paietta, Ann C. (August 7, 2007). Teachers in the Movies: A Filmography of Depictions of Grade School, Preschool and Day Care Educators, 1890s to the Present. McFarland. ISBN 978-0-7864-2938-7. Wikimedia Commons has media related to Josh Hutcherson.